This t-shirt shows what happens when Pac Man looses. You can see Pac Man being cornered by the ghosts and he can’t go anywhere. The ghosts say things like “What’s the matter, round boy? ” and “Ran out of pellets?”. A shirt like this is perfect for someone who like the classic video games. You can get this Pac Man t-shirt in a men and women’s version in sizes ranging from Small – 6XL. 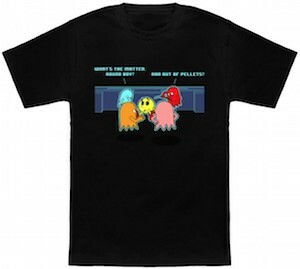 So if you want to tell the world about ghosts being bullies then you should take a closer look at this Pac Man Ran Out Of Luck T-Shirt. Why get a boring oven mitt when you can have one that looks like a ghost from Pac-Man. This light blue oven mitt looks just like Inky the Cyan color ghost and he loves to hold you hot pots and pans and cookie sheets to. 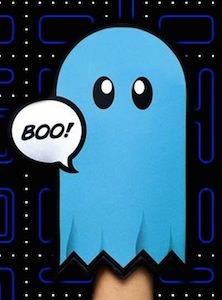 Besides being an amazing ghost he even has a speech bubble that says “Boo!” but don’t be scared, Pac-Man will take care of him if he gets to be a problem. Video games came to the kitchen with this fun looking oven mitt. I think you could use a new oven mitt and I would go with this Pac-Man Ghost Oven Mitt. What do geeky guys love most besides their computer? Yes geeky girls and that is why they love you to wear this gamer girl t-shirt. Or at least if you are a gamer girl. This purple t-shirt has a pink ghost on it just liked the once in the Pac Man video game. Above the ghost you see in green the words “Gamer Girl”. As you can imagine from the picture above this t-shirt is a lot of fun. 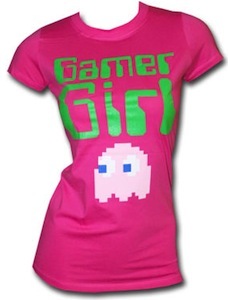 Time to surprise your self or your girl with this Pac Man Gamer Girl T-Shirt. 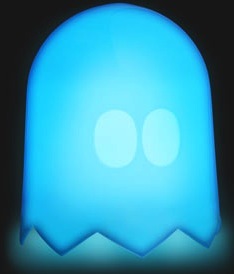 The Yellow creature called Pac Man is afraid of little ghosts so to keep him out of you home you can get some ghosts but most ghosts are more annoying then Pac Man so that is not a real solution. But now there are ghosts lamps. They look like ghosts but they are just lamps that turn them selves on when it gets dark. They come in Blue, Yellow, Red and White. so you can choose your favourite ghost color. You just plug them in a USB port and you are good to go. Come have a better look at these cute Pac Man Ghost Lamps.